Not my normal sort of telescope. 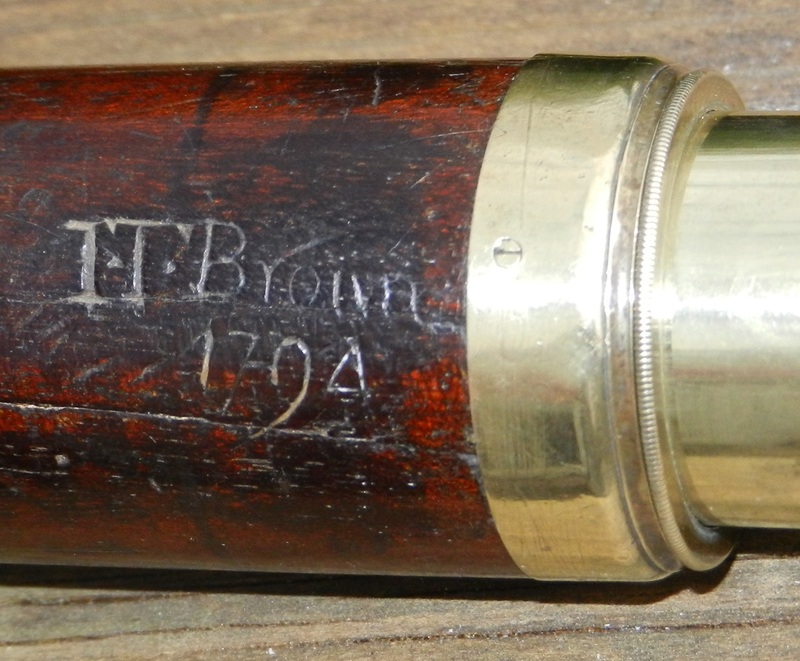 The name engraved on the barrel really fascinated me, it said “I T Brown”, and added the date “1794”. To have a telescope actually dated is quite rare, so this was worth looking at, and 1794 is a really good year: but how do we know the wood engraving on the barrel is genuine? The maker is ‘Gilbert, Wright & Hooke’, as engraved on the first draw, with ‘LONDON’ and ‘Best Improved’ after: and it has an 18th Century sharkskin case, much worn over the years. Searching the name I T Brown did not give any definite leads, there were several Browns in the Royal Navy at that time. More interesting was that Gloria Clifton’s book on Scientific Instrument Manufacturers advised that Gilbert, Wright & Hooke only operated, in 148 Leadenhall Street, from 1794-1801, so the timing is right for the date of 1794. 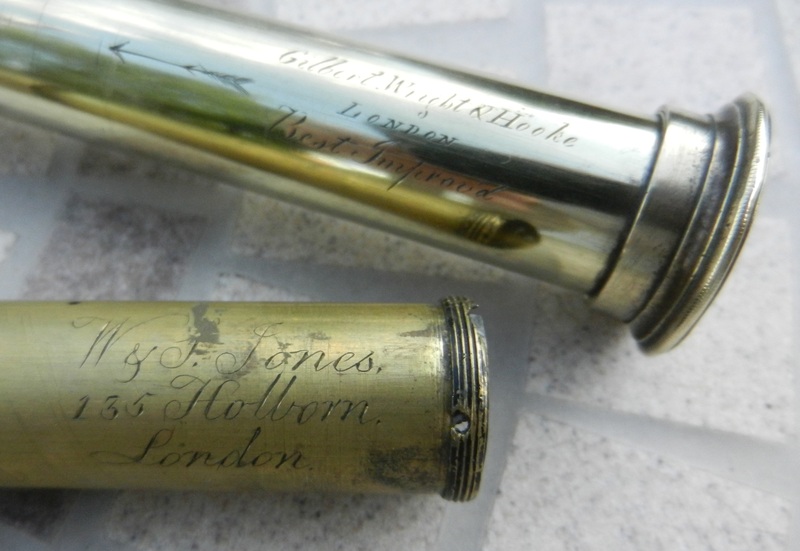 This partnership took over from the business operated as Gilbert and Wright: the engraved script on the telescope looks as though the ‘& Hooke’ was added later. The telescope is a 3-draw pocket telescope extending from 5.25” to 15”, with a mahogany barrel, end cap over the objective, and slider over the eyepiece lens. The diameter is 1.25” at largest. The brass draws polished up very nicely, without too much effort. Each draw is labelled with two arrows, I presumed to show how to best line-up the draws when using the scope, but Chris Lord suggests in the comment below this could be an aid to a dismantler. In the first draw this arrow with an associated marker line around the draw presumably indicates the best long distance focal point. There is also one air discharge hole, in the third draw. The eyepiece slider has an interesting addition, which looks like a ruby coloured lens of a small diameter, which you would assume is to protect the user’s eyes from glaring sun. But the problem is that I can’t see any light through this lens at all. Another telescope in the collection, part of a combined telescope/microscope set, has a similar ruby coloured eyepiece lens, presumably for use with the microscope attachment. Maybe for use with UV light or similar??? 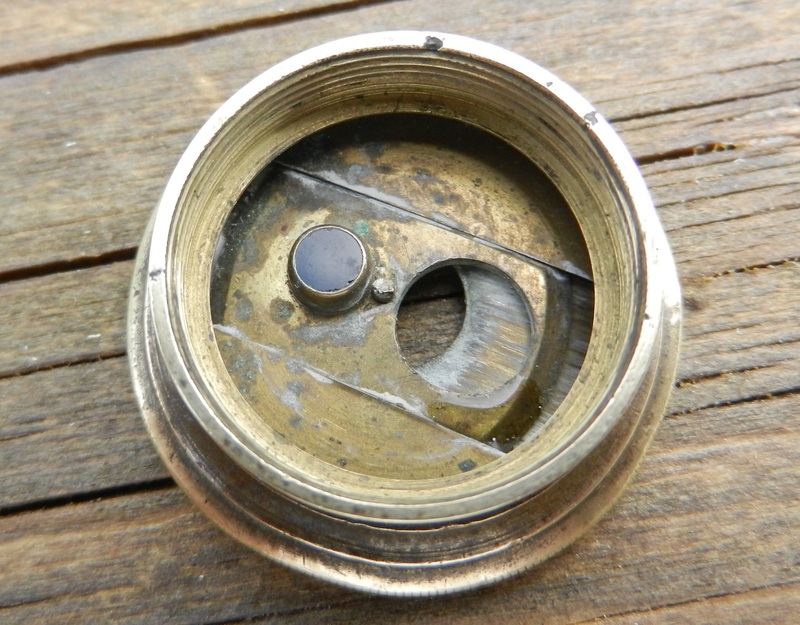 Interestingly, the screws holding the brass bezels onto the mahogany barrel are all original and very small: smaller than are easily obtained today, when it seems such screws are not produced in our modern micro-miniaturised society! The first telescope subsequently bought, on Ebay, to be cannibalized for spare parts (ie an objective lens pair), was un-named, and the focal length was too long. The second one bought was in a really battered state, but the objective lens seemed OK. This telescope was engraved as manufactured by W & S Jones of 235 Holborn: they operated from there between 1792 and 1800. Side by side the two looked very much a pair, so maybe even in those days they copied patterns from each other to serve the growing new market! The W & S Jones scope was slightly shorter, so the objective pair has a slightly shorter focal length: but the brass housing for the objective has the same screw thread and size as that of the Gilbert, Wright & Hooke version, so the lens fits well. The difference between these two models of the same design is shown best by their weights, the Gilbert one weighs 240gms and the Jones only weighs 190gms. The telescope now works as it should, albeit with the focal point slightly further in than it would normally be expected to be. Plus all the components date from the 1790s, even though the objective is not the actual original. Even the screws into the mahogany are original. Who the first owner, I T Brown, was, or where he sailed, we don’t yet know, but the search to find him goes on.